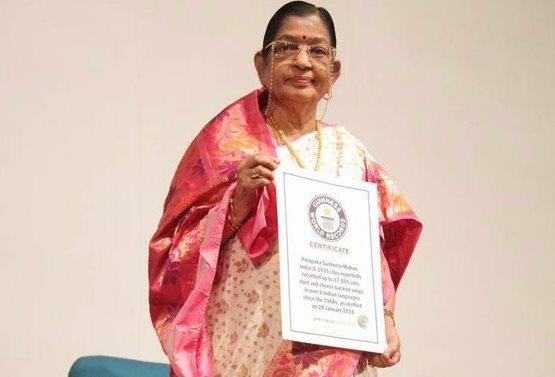 Legendary playback singer P. Susheela has become the Guinness World Records title holder for the highest number of solo, duet and chorus backed songs in over six Indian languages. Pulapaka Susheela, 80, is from Andhra Pradesh and in Telugu alone, she has sung close to 20,000 songs, followed by around 10,000 songs in Tamil, besides many more in other languages. In an official certificate presented by Guinness it was verified that she has sung 17,695 solo, duet and chorus backed songs as on January 28, 2016. With an illustrious career lasting over five decades, Susheela has over 30,000 songs to her credit across multiple languages. Having made her singing debut in 1952 Tamil film “Petra Thai”, she went on to croon in several classics such as “Missamma”, “Savaale Samaali”, “Siri Siri Muvva” and “Meghasandesham”. She has five National Awards to her credit, besides the coveted Padma Bhushan honour, which was presented to her in 2008. Speaking about the awards, P. Susheela reminded everyone present that the adjudicators had only considered songs she had song from 1960s. “Please remember that I started singing from 1951,” she said. When asked why she is not singing anymore, the singer said that she would love to sing in movies if someone offered a good song. When she was nudged by journalists to sing her favourite song, she ended the press conference by singing Ennai pada sonnal, enna paada thondrum from Pudhiya Paravai, a hit song of 1964.